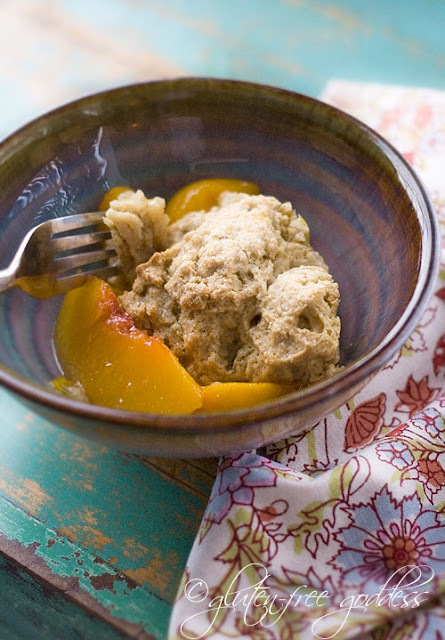 I started out with a different approach to this peach cobbler recipe, you see. I thought I'd try out the new Betty Crocker Gluten-Free Bisquick mix I bought this week. I imagined a golden topped biscuity crust you could sink your teeth into, a melt-in-your-mouth forkful of shortcake, dripping with warm and sticky-sweet juice. But what I got was a bone white mound of anemic dough (scarily reminiscent of Play Dough baked into what can only be described as yesterday's mashed potatoes. It didn't even try to turn golden. And it didn't melt in your mouth like a biscuit. It just sat there on your tongue. Expecting to be admired without effort. Like those fame junkies who are famous for simply being famous. They haven't actually accomplished anything to garner their celebrity status. They just nurture a deeper narcissistic ambition than your average high school beauty queen. They expect adulation because they exist. Like an awful lot of the gluten-free foods churned out by corporate entities. They expect we'll fall to our knees with gratitude just because it sports two little words on its label. As if the virtue of being gluten-free is enough. Enough to get us to shell out almost seven hard earned dollars for two and a half cups of cheap refined starch and the privilege of convenience. And don't get me wrong. I get the allure. I do. I mean, you're standing there in the supermarket. It's late. You're hungry. And it's right there in front of you. Right next to the 40 acres of shiny wheat laden stuff you can't have. Ever. And those magic words: Gluten-Free! They sparkle. Someone up there in the land of corporate giants has heard of us! They validate you and your odd little disease. And hence, we may consume. They are recognizing us now, Sweetpea, because we constitute a billion dollar windfall. 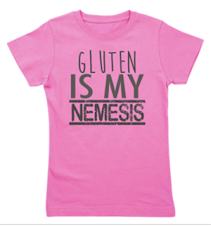 The food industry has awakened to the perky reality TV version of celiac disease. And sure, I know. The argument is, It's all good. Any awareness is positive (even though the gluten-free diet may be in danger of losing street cred because of its faddish status with actresses who subscribe to its hyped promise of weight loss). Can the drive for GF profit lead to better eating, though? I'm not so sure. If the tepid taste of Betty Crocker's Bisquick is any indication, we have not come a long way, baby. Big companies use the cheapest ingredients they can to conjure stuff for the growing gluten-free demand. That means there's an awful lot of "old school gluten-free" going on (based on Bette Hagman's twenty-year old white rice flour and starch blend, perhaps?). G-free mixes and packaged foods use predominately refined white rice flour and inexpensive starches. A glut of empty calories. Like @AutumnMakes tweeted yesterday, "...funny how it seems the big corps are years behind the everyday gluten-free bakers..."
Indeed. We humble home cooks have discovered the soft, lovely crumb of sorghum and almond flour. Gluten-free cornmeal and buckwheat. Our baking isn't dull or crumbly, dry, or without pizazz. 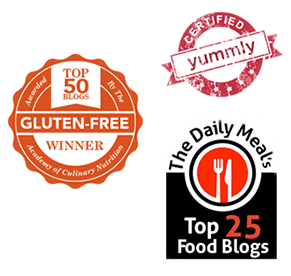 Our flour choices reflect a preference for taste, texture and higher nutrition. And I think we're smarter than the average consumer. So for now I'm going to continue to eschew the walk down the center food aisles (as Michael Pollan advises). I'll focus on my own gluten-free flour blends and eating whole foods daily. And in a pinch, when some wild craving hits and I'm too tired to deal with three separate flour bags, I'll use a GF pancake mix (both small family companies who have been in our celiac corner from the beginning). And I'll create my own cobbler topping, thank you. Recipe originally published August 2010 by Karina Allrich. I recognize that some of you may not use almond meal due to nut allergies. Bob's Red Mill Gluten-Free Cornmeal or certified gluten-free oat flour would also work quite well. First: Preheat the oven to 350ºF. Lightly grease an 8x8-inch baking dish or two large/four small individual gratin dishes. Pour the sliced peaches into a pot and stir in the light brown sugar and tapioca starch till coated. Heat over medium heat until the peaches start to bubble a little around the edges. Turn the heat to low and cook for eight to ten minutes. This gives the peaches a head start in the baking department. The biscuit dough will come together quickly- don't beat it to death. Just till smooth. It should be a wee bit sticky (not too wet and not too dry) like a biscuit dough/batter. 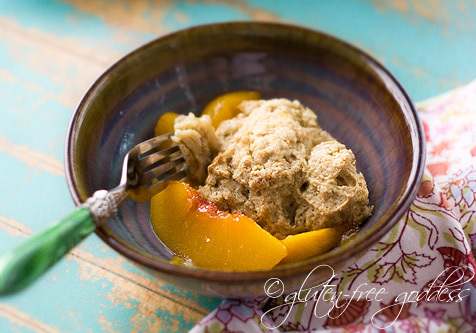 Plop spoonfuls of the biscuit dough on top of the peaches. I ate this warm for breakfast. It was fabulous. 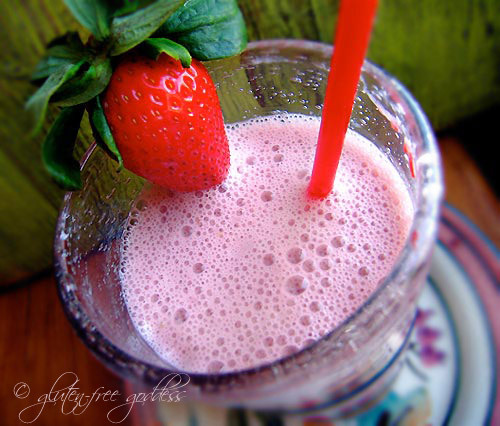 It would also be wonderful for dessert with a scoop of coconut ice cream or frozen yogurt. While you might be tempted to use the topping recipe for biscuits, I think the recipe would need tweaking for a true biscuit texture. Stay tuned, as I'm working on a gluten-free biscuit recipe, as well as a pot pie crust. 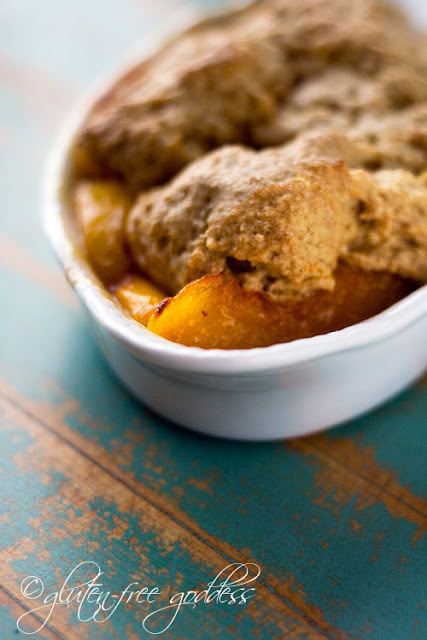 Peach cobbler made with my own biscuit topping, thank you.